The deals keep coming this week while we work with Cents of Style. This new deal is for some really fun jewelry. I love the You Do You necklace. Each of these tribe necklaces say something inspiring or current. The code is 2FORTRIBE and it will make the final price just $12 when 2 pieces are added to the cart! The code is valid Tuesday, 7/25 only! THE DEAL IS 2 for $12.00 and free shipping. What you need to do: You need to head on over to Cents of Style and use the Code 2FORTRIBE. 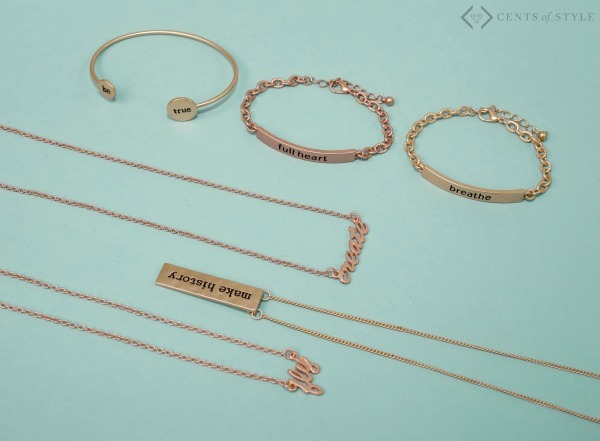 Which piece of jewelry do you like the most? Recently I went on a cruise to the Caribbean and the main focus seemed to be shopping. I got caught up in it a bit and had a great time shopping (window shopping) with my mom, daughter and grandmother. We were looking for deals and one of the deals was for pearls. My husband said if I find them I should get them because they would look great on a blogging trip. I never found them, and came home to this Baroque Freshwater Culture Pearl Strand necklace from Blue Nile. Facebook Fans of Blue Nile’s Facebook page will experience an interactive, cozy fireplace setting that’s surrounded with presents and holiday features. Each day, you may select and “virtually” unwrap one of six presents in hopes of winning one of 12 extraordinary jewelry prizes from Blue Nile. One extraordinary jewelry prize will be awarded each day, and range from $3,500 to $13,500! Prizes include, but are not limited to, multiple diamond engagement rings (including one from the new Monique Lhuillier line), 2-carat diamond earrings, a sapphire and diamond ring, and a 4-carat diamond bracelet. All told, $100,000 worth of extraordinary jewelry prizes will be awarded from November 26 – December 7. · There are six unique presents wrapped and displayed for each Facebook fan on Blue Nile’s Facebook page. In order to participate, fans must “Like” the Blue Nile Facebook page. · For 12 days, Facebook fans will have a chance to unwrap one present of their liking to win a Blue Nile prize. · It is a game of chance. Prizes vary from percentage off discount codes to $11,000 diamond rings. We’re happy to say that we will be giving away a cumulative prize value of $100,000 over the course of 12 days. · One extraordinary jewelry prize will be given out per day, but everyone will win something. · The campaign will kick off on Cyber Monday (November 26, 2012) and end on December 7, 2012. Offer MUST be entered in cart or mentioned over phone at time of purchase. 20% discount applies to silver or pearl or gemstone jewelry, only. 20% off applies to only one item in one category, and does not apply to loose diamonds, Build Your Own Diamond Jewelry, gift certificates, and cleaning product purchases. Offer may not be combined with any other offer and cannot be applied retroactively. Void where prohibited. Offer valid through November 29, 2012 at 8:00amET. A couple months ago, I wrote about Yala, a company that keeps social good at the top of their list. I was so excited about this company, I have recommended them to my friends and family. In fact, Yala is going to play a big part in my sister’s special day! Next month, my sister is going to be getting married. As her older (and wiser ;)) sister, I am the Maid of Honor. If you want to be all technical about it, I’m actually the “Matron” of honor… but that just sounds OLD. Nevertheless, I’ve been hard at work helping my sister plan out all the details of her special day. When she came to me asking about jewelry and gifts for her bridesmaids, I knew EXACTLY what to tell her. The Yala Free Soul Collection makes the perfect stop for gift shopping. My sister knew that she wanted something special and meaningful for her nearest and dearest friends. She also knew that she wanted jewelry – affordable, stunning, jewelry. Most of all, she wanted something that had a purpose. Not just a shiny object… but something that was for the greater good. Yala jewelry is made by women around the world. Through a partnership with Nest, women in developing countries are able to make big changes in their lives. These pieces of jewelry help provide an income and a sense of stability to women, their families, and their communities. THAT is a gift that carries some meaning! Who would like a gift from Yala’s Free Soul Collection? ANYONE! This is the season for graduations and weddings – both the perfect opportunity for a meaningful gift. They’re also the perfect opportunity for adding a little something special to your own look. I know that my jewelry collection has definitely improved since I was first introduced to Yala. To get your collection started, you can use this discount code set up especially for MomStart readers. Your coupon code is SOUL20 for 20% off and it’s good from April 9th – April 23rd. That’s plenty of time to stock up on some great jewelry or even some AMAZINGLY soft clothing from their Bamboo Dreams collection. I have not received any compensation for this post. The opinions and views expressed are that of my own. It’s raining outside and the kids are grounded. I’m not sure how much of a punishment it is for the kids. It almost feels like more of a punishment to me. We can’t play with friends and Miles has lost half of his toys. So I find myself having to entertain them more than I usually do. We decided to make a craft or two day. The first one we made was straw necklaces. It’s real simple and you probably already have everything you need. Things Remembered is featuring some really cute items as unique birthday presents. I found many of them so cute it was hard to pick one to focus on for a review. Since something we’re working on at home is saving money, and my son doesn’t have a cute piggy bank, I finally ended up choosing the Silver-Plated train bank and had them engrave I think I can on it. It’s ADORABLE. Silver-Plated Train Bank – It’s never too early to teach children the value of saving. This adorable train design makes it fun, featuring intricate train detailing to look like the real thing. For easy removal of money from the bank, there is a plastic cover on the bottom. Be sure to engrave a name and date for a treasured keepsake. He’s going to be saving lots of quarters in this little train. Other Unique ideas from Things Remembered. Retractable Ear Buds – Teens can’t live without their music. When they’re rocking out with their mp3 player or iPod, pristine sound is good – tangled cords not so much. Just give the cord a little pull, and both sides retract into the housing. No tangles! The rubber buds fit comfortably in the ear, and the gunmetal look is as cool as the music on your favorite fan’s playlist. Engrave it with a special message and your gift is guaranteed to be a big hit. Kids’ Silly Sac Bags – This charming bag is a practical but fun gift for kids. Great for school, sleepovers or day trips, these “silly” bags can be embroidered with his or her name on the belly to make it even cuter. Choose from the Monkey or the Turtle bag, each equipped with a side zipper, adjustable straps and a mesh body. They’re as precious as all the little things kids will stuff it with. Available online only. Birthstone Key Necklace – A great gift for moms, this necklace also lets her celebrate her loved ones’ birthdays, too. Each polished sterling silver heart key can be customized with the birthstone and engraved with the initials of her soul mate, her children or anyone else she wants to keep close. Available in multiple key/birthstone configurations. Choose up to 3 keys/birthstones for review. Friends Shadowbox Water Globe – How do you tell a friend how much she means to you? This handcrafted water globe commemorates the special times you’ve shared in a unique way. A tiny friends "shadowbox" inside the globe contains the sentiment, "By my side no matter what I do. I’m so lucky to have a friend like you". The globe rests upon a silver-plated base that can be engraved with your best friend’s name or a special message of your own. Plus, it’s musical, playing Bach’s Minuet No.1. Sports Tankards – If he’s a sports fanatic, these drink tankards are sure to raise a toast from your #1 fan. Choose from NFL Tankards or NCAA Mugs, emblazoned with the colors and logo of his favorite team. These robust mugs safely hold his favorite beverage, plus they can be engraved on the back. Add your favorite fan’s name and you’ve got a gift that they’ll show off all year long. This giveaway has ended. Congratulations to the winner, ShellieAndBrutus. I have never really liked wearing jewelry. I can’t even fit into my wedding ring right now. I haven’t been able to wear it since I was pregnant with my daughter who is now almost three years old. Now, the only thing that I wear is my necklace but I do have a special place for one bracelet. For a Girls Bracelet to be special it either needs to come from someone special or have special meaning. One of my most cherished items that I have is a charm bracelet that my grandmother gave to me. She gave all of her granddaughters one. I kept it treasured and I still do. Every time she went on a trip. She would collect us another charm. So I have charms from all over the world. When my grandmother was in better health she loved to travel. I received these from Joolwe.com and I do find them to be very pretty. The first thing I did was put them in my ears. That is always the test for me and well, they made my ears itch in minutes. My husband kept asking me if my ears were ok and I said yes, but I finally gave up and took them out. I guess my ears can only handle gold. I thought sterling silver was ok, but my ears must be getting more sensitive as time goes on. I think my whole body is. That being said, I do like the CZ Silver Pendant that they sent me. The chain is is great and the Cubic Zirconium looks amazing. CZ is a great way to save money and still look great. Buying jewelry from Joolwe will save you money because their prices are pretty comparable or under comparable. You can check out the silver jewelry store and their jewelry blog to see all of their choices and special promotions. Thank you to Family Review Network for this review opportunity!